No matter how good your skills as a tiler might be you cannot get around the problem of shrinkage and expansion that all buildings constantly undergo throughout their existence. For this reason even the best tiling job using the best materials will be subjected to movement which will in time develop into tiny cracks in the grout line. Once a crack develops this provides a route for the ingress of moisture behind the tile. Unless you protect against this the moisture will permeate into the fabric of the building. By the time you discover a wet patch or notice the odour of dampness the problem has well and truly taken hold and the only solution will be costly remedial work. It pays to protect against this inevitability before you begin to tile. Wallsafe is a liquid membrane that forms an effective barrier between the wall and whatever you care to hang. Even if water should find its way through the grout line it has nowhere to go. 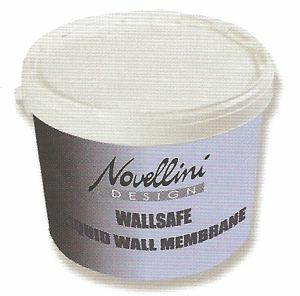 Novellini Wallsafe is a solvent free 'liquid membrane' suitable for use on all commonly encountered substrates. It is quick and easy to apply and carries a Lifetime manufacturer's guarantee. Fully compatible with Tilesafe or Screedsafe tanking membranes, you can rest assured that the waterproof integrity of your shower area is.... safe! Coverage: Approx 8 m2 according to application thickness. Application method: Applied by brush. Two applications recommended brushed at 90o to each other. Air dry cure. Please be aware, the price quoted for this product shall apply when forming part of a larger order for Novellini wet room products. When ordered on its own or with other branded items a delivery charge may be payable. Delivery charge: Delivery on these Novellini products shall be free when ordered with Novellini Screedsafe, a Novellini Duo Deck/Quattro Deck, Novellini Linear Floor or Linear Wall drain for screed floors. If ordered separately or with other branded products a delivery charge will apply. 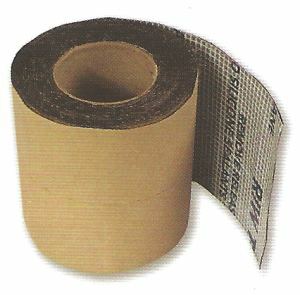 Wallsafe reinforcing tape is supplied on a roll 150mm by 7.5 metres in length. It has a self adhesive backing and offers a waterproof barrier for application around critical details such as wall junctions, soap recesses, pipe boxes and other such areas. Please be aware, the price quoted for this product shall apply when forming part of a larger order for Novellini wet room products. When ordered on its own or with other branded items a delivery charge will apply.